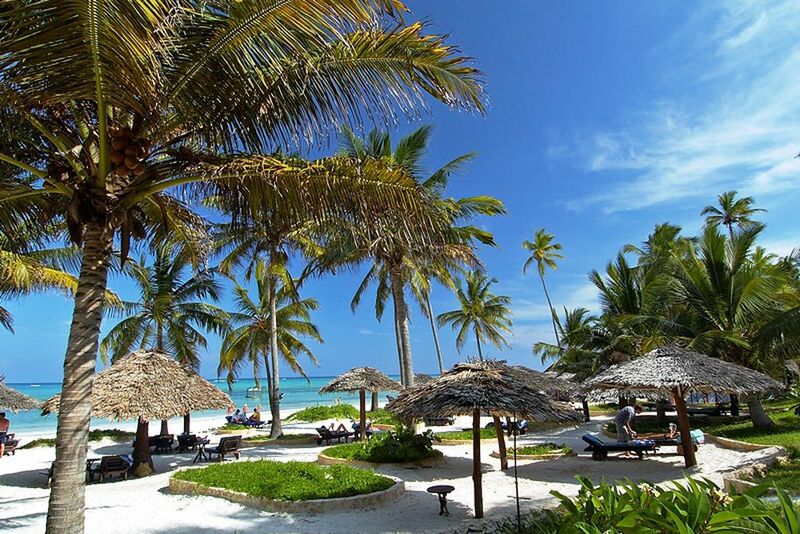 Come here and enjoy Zanzibar's exotic nature surrounding the hotel. The hotel's lounge has a pleasant atmosphere that will set you up for the next relaxing day. 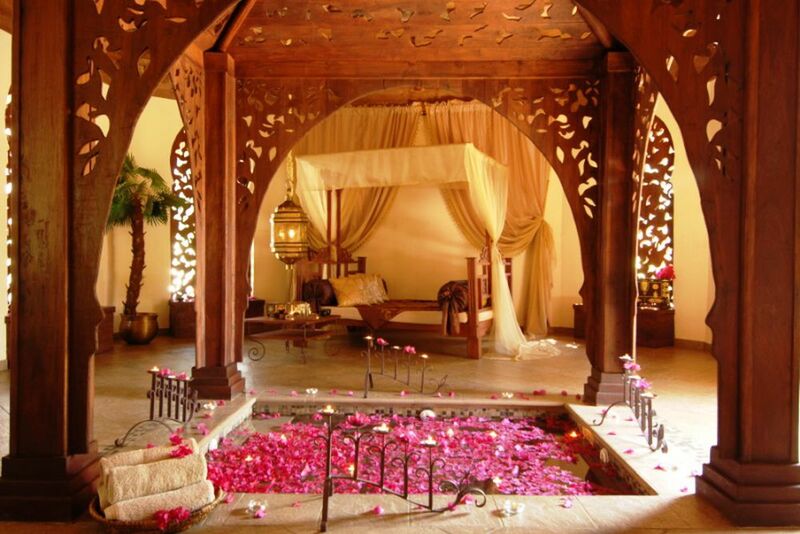 Pure romance and a breathtaking view - be sure to expect all your romantic getaway dreams to come true. Enjoy togetherness and delicious food in the à la carte restaurant. 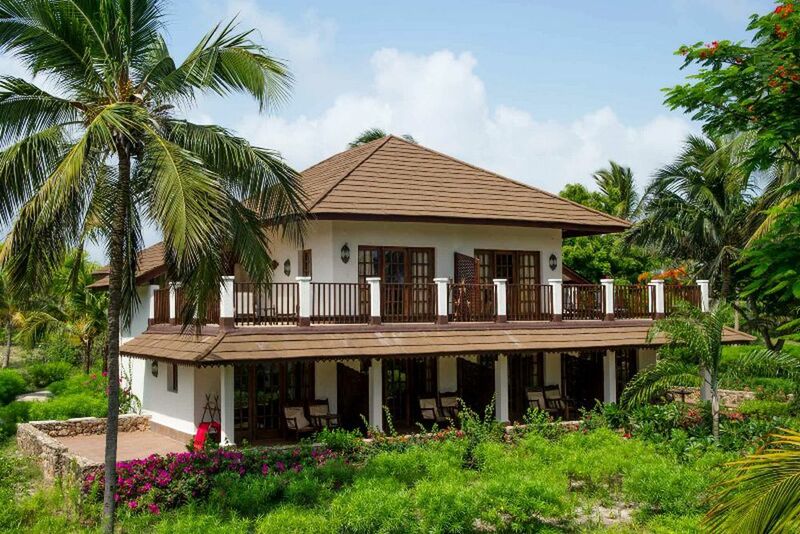 Nestled in the greenery, the Breezes Beach Club & Spa is a welcome place for relaxation. 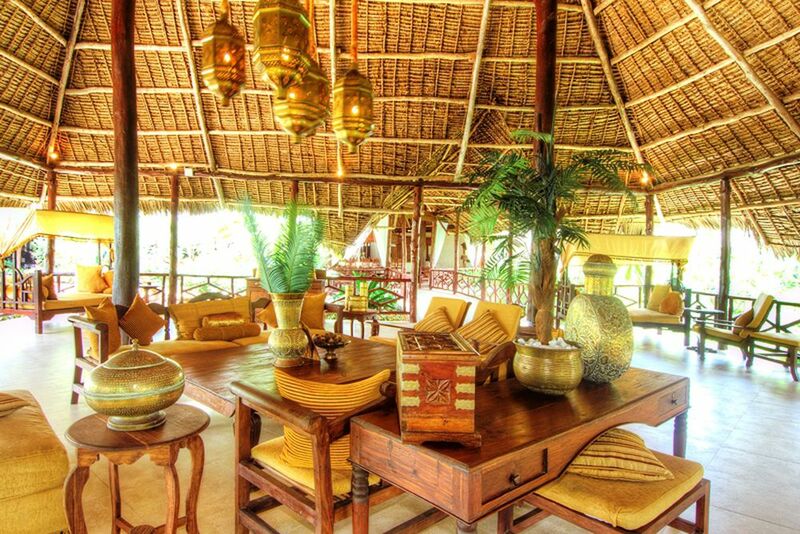 A pleasant breeze blows through the Beachfront Lounge. 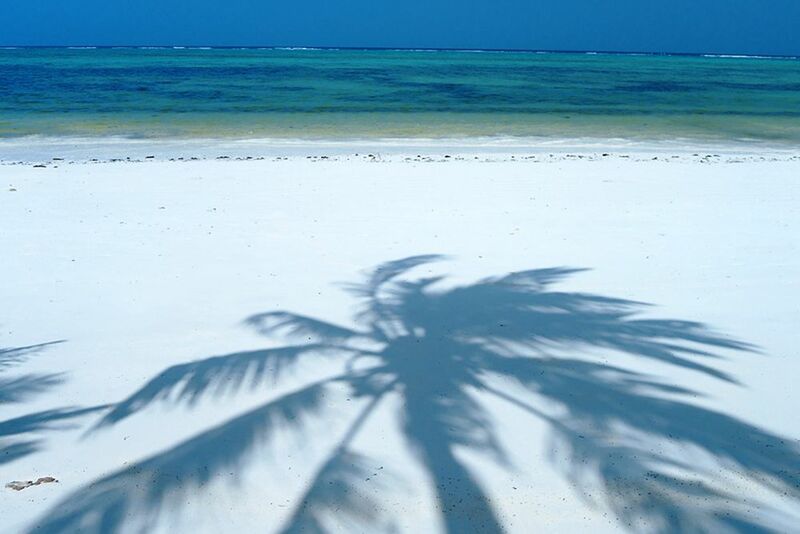 Pleasant waves and light breezes blow through the palm trees. A beautiful panorama that you will not forget so quickly. How about cooling off in the pool? Large rooms and pleasant colors provide a feel-good atmosphere. Enjoy beautiful views from the large windows. 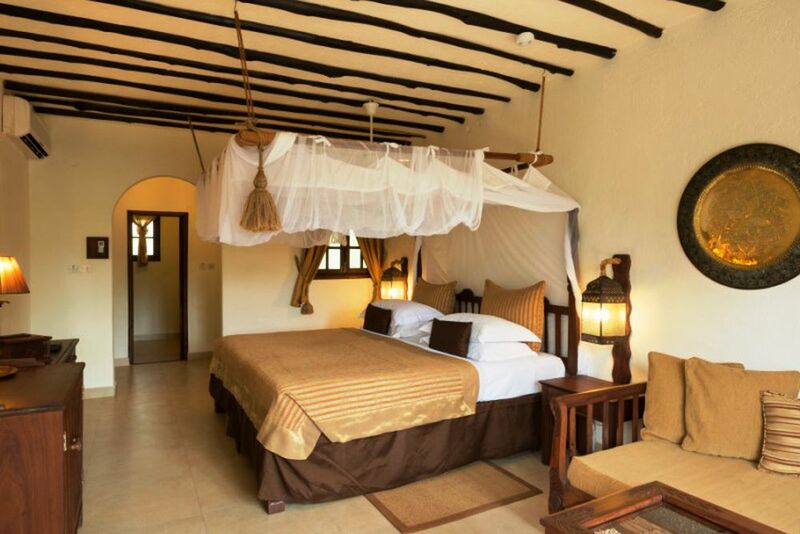 You will find everything you need for a pleasant stay in the rooms. Palm trees provide pleasant shade by the pool. Blue sky, pleasant temperatures and soft sand under your feet. 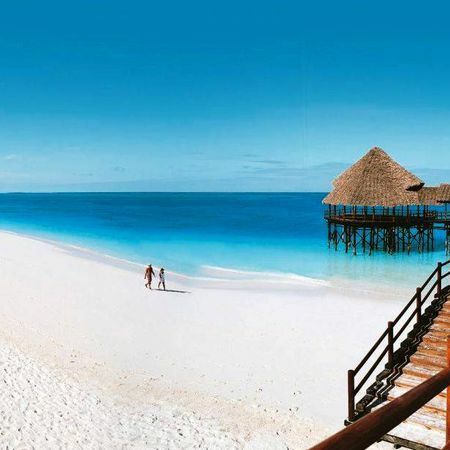 Here you can enjoy the warm temperatures of Zanzibar. Absolute privacy and togetherness - every wish is granted here. Coffee and cakes are served in the afternoon at the Chai Tea Lodge. The local food is fresh and one of the highlights of the hotel. 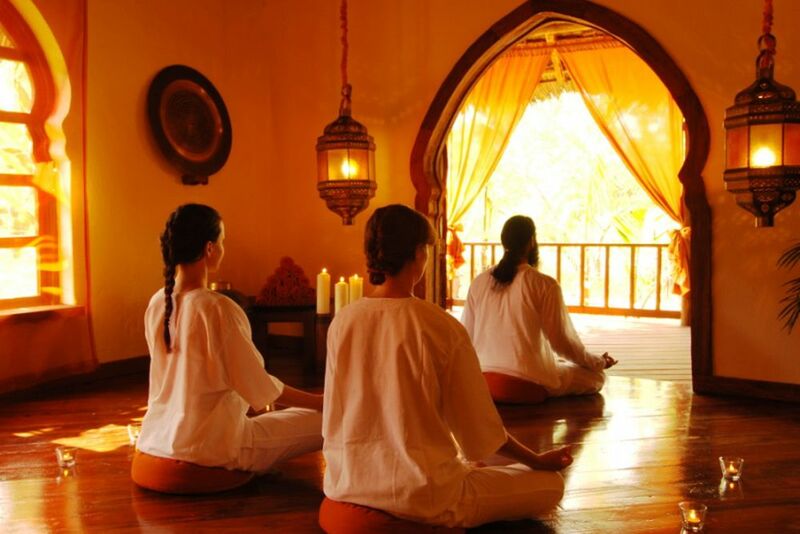 Enjoy a moment of peace during yoga and meditation classes. Everything is done for your well-being in the spa area. Just relax and enjoy the holiday - you will quickly get into the holiday mood in the Breezes Beach Club. 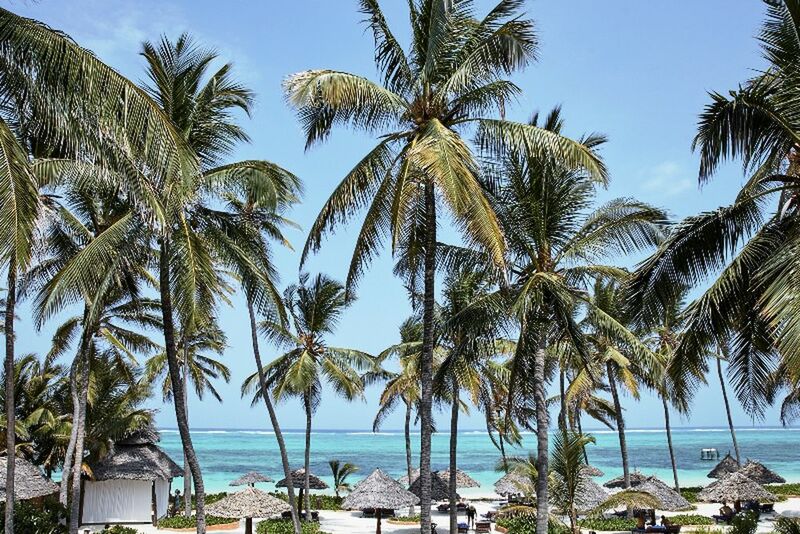 Extensive walks on the beach and a dip in the sea - welcome to Zanzibar. 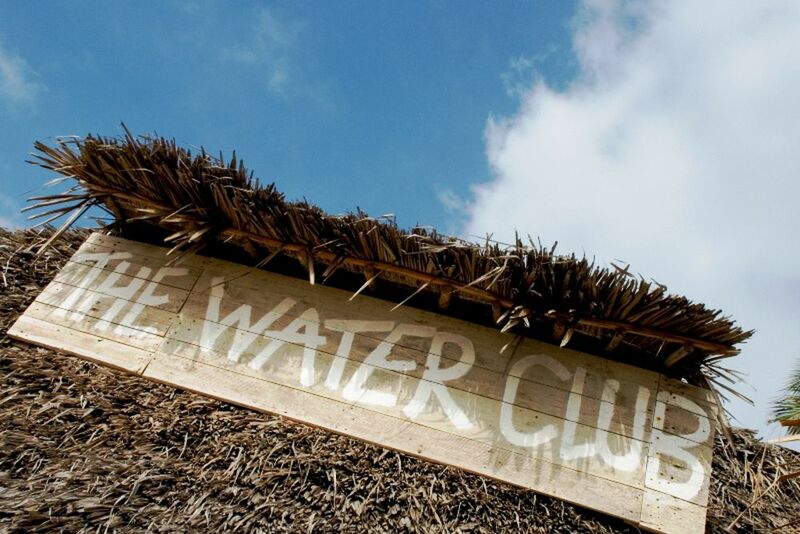 The Water Club is a magnet for all ages, as it guarantees water fun of all kinds. 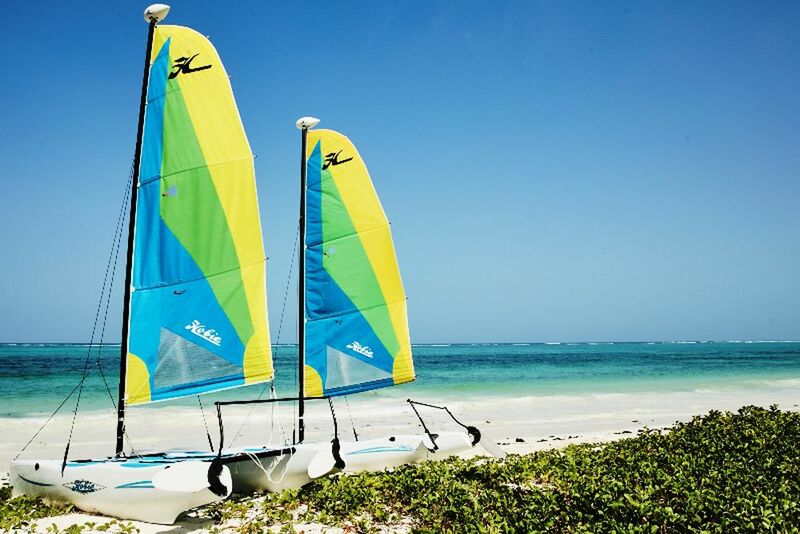 Ever wanted to sail the catamaran across the sea off Zanzibar? Go to the Water Club, then. 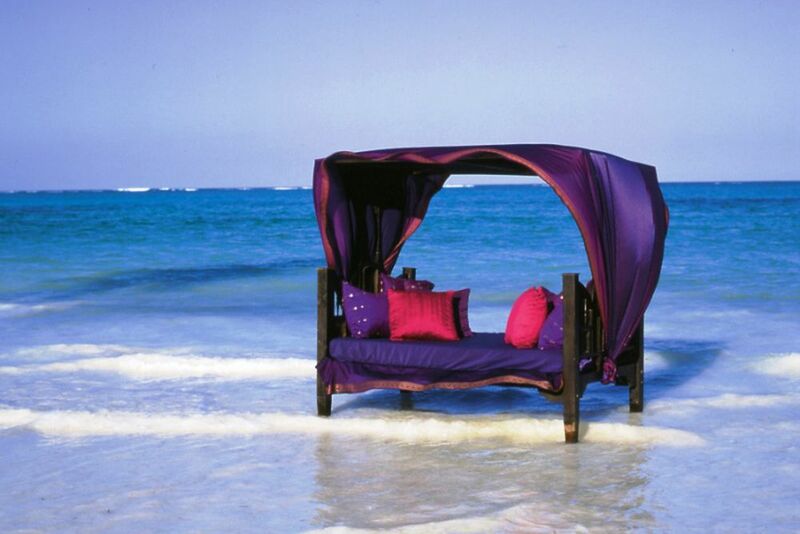 At the Tides Restaurant, you can exclusively book a cabana and enjoy togetherness. Expect a varied entertainment program in the evening. The evening atmosphere is just as pleasant as the daytime one. 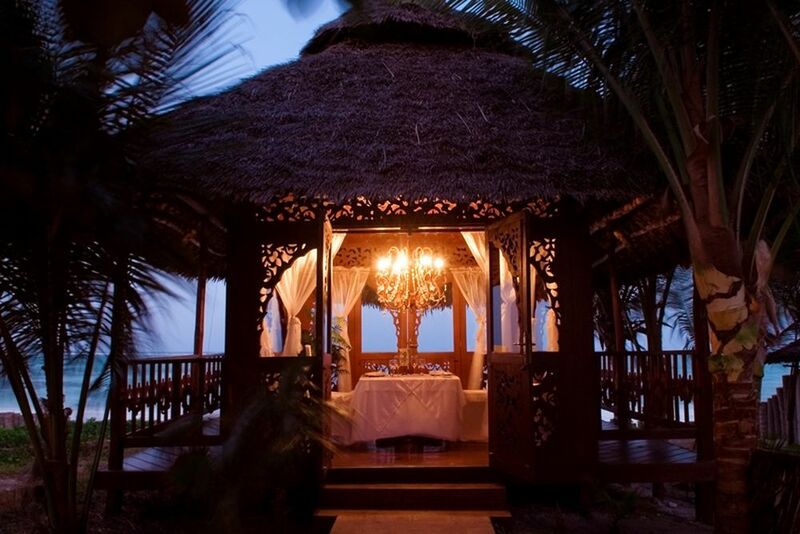 Looking for a romantic getaway? Breezes Beach Club is the perfect place for you! This resort provides the ideal beach holiday: full of tranquility, luxurious facilities, authenticity love for detail, privacy, private dining and superb hospitality. 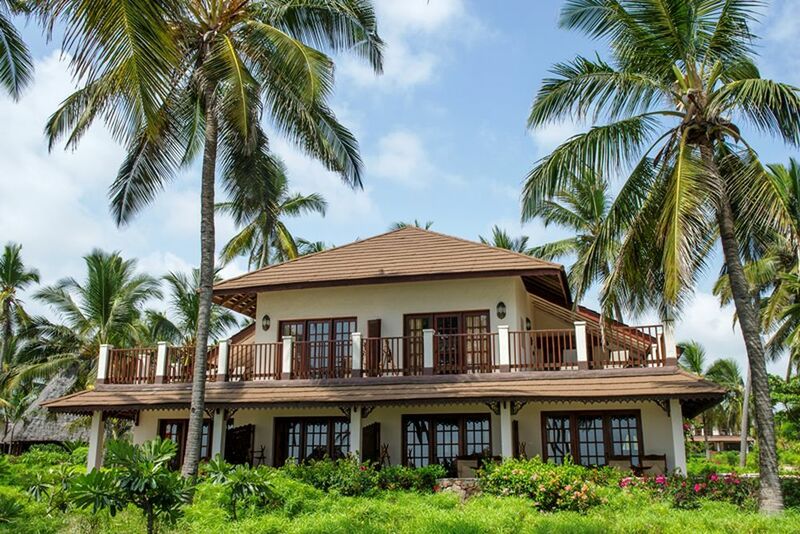 Standing on the pristine and unspoiled beach of the southeast coast, the resort is located in one of the most peaceful and pristine areas of the island. All those who love beach holidays are in the right place on the award-winning beach of the hotel. 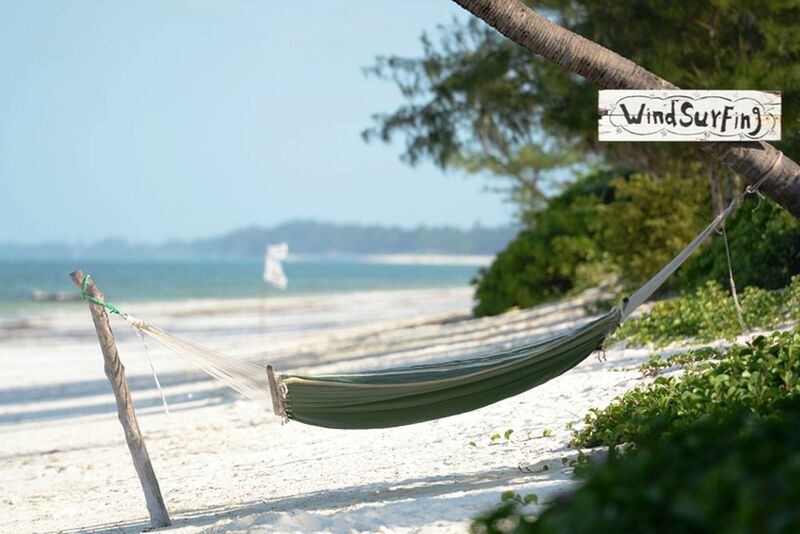 The pristine and endless sandy beach is a magnet for anyone visiting this resort. 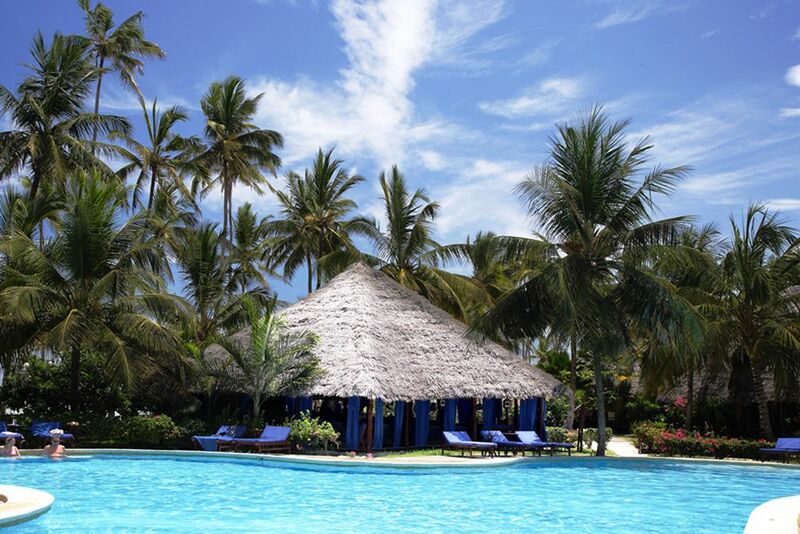 The town of Bwejuu is just 5 km away and Zanzibar International Airport can be reached in about an hour. 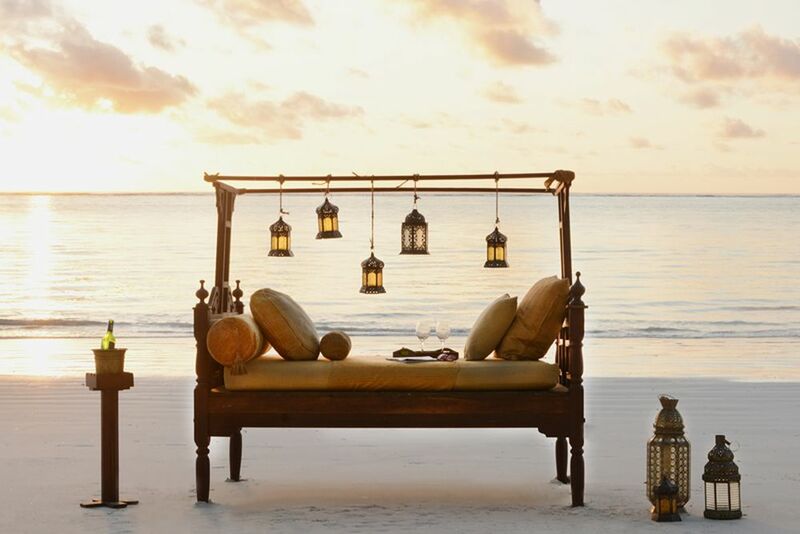 Famous for its attention to detail, intimate and private dining, the Breezes Beach Club & Spa’s beautiful Zanzibari décor — stunning carving, glistening brass and rich fabrics — create an elegant and unique atmosphere. Shop at Breezes’ bazaar for a selection of souvenirs and African art and handcrafts. Relax by the glistening pool after an exciting day of adventures. 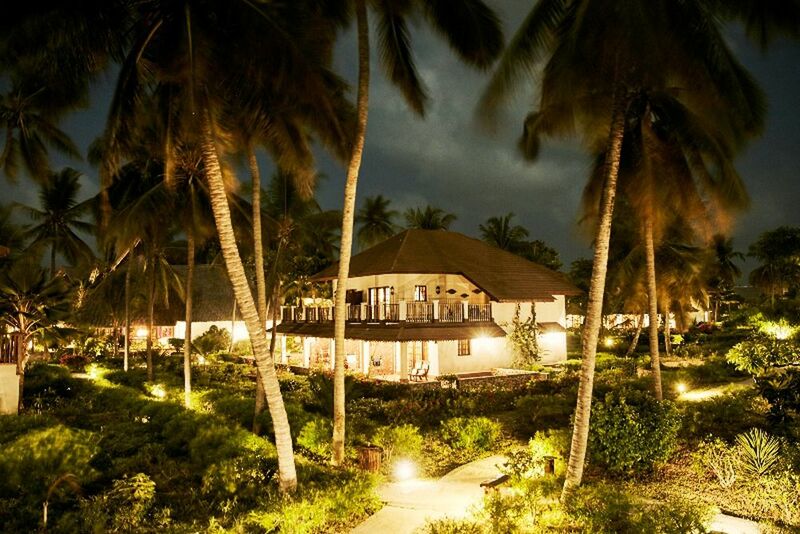 For a wonderful experience of indescribable nature, there are no TVs provided in the rooms. Should you however, want to stay informed, you can book a TV Room and enjoy countless international broadcasts. 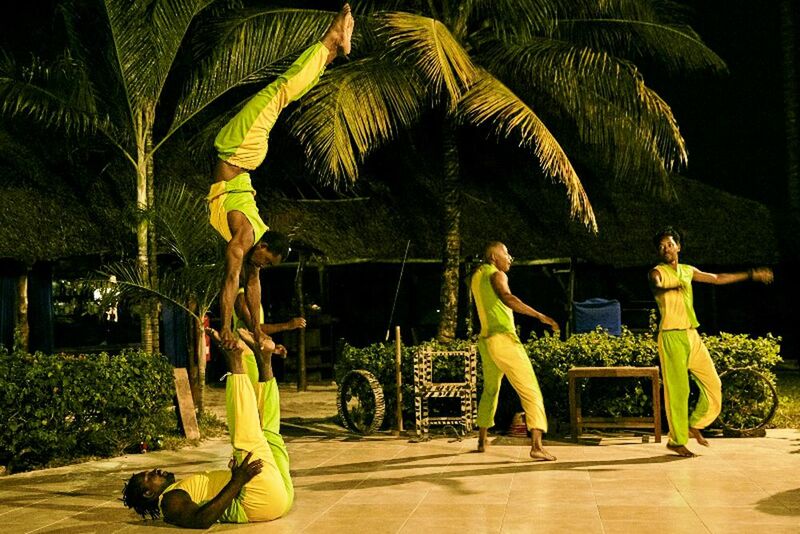 For wonderful entertainment on a quiet evening, there are varied performances of singers, dancers and acrobats. Indulge in gourmet dining at Breezes Beach Club & Spa—and thanks to your half-board arrangement, mornings and evenings are covered at one of the delicious restaurants! Start the day at Salama Dining room, where a breakfast buffet is served and a 4-course menu is offered in the evening. 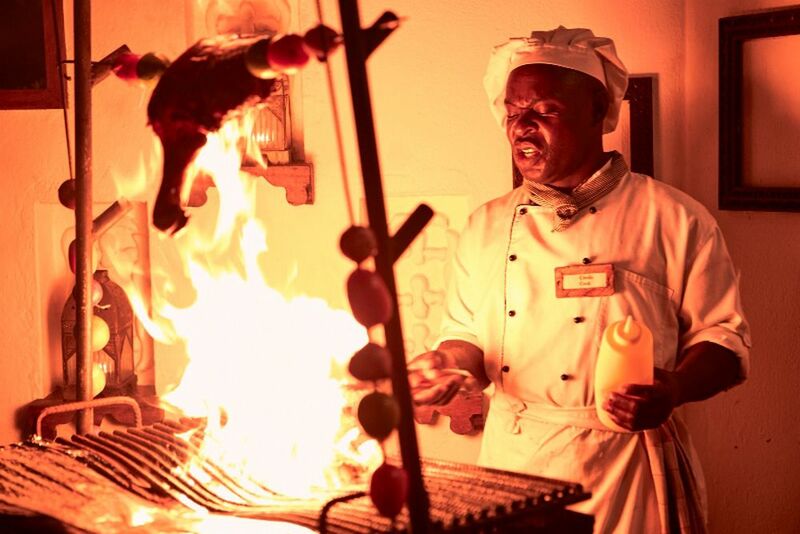 Theme nights are also organized here once a week, along with a Swahili night, BBQ night and evenings revolving around all sorts of spices. 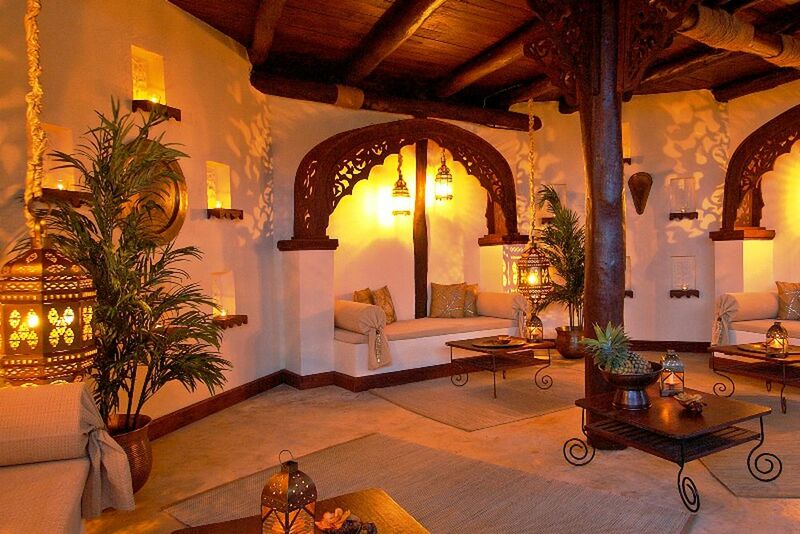 The Safari Bar offers a relaxed candlelit atmosphere in the evenings. The Dhow Bar/Pool Bar is an ideal retreat from the sun during the day. There are numerous seating areas and a sand floor. The Tides is a private beachfront dining for two in an intimate setting overlooking the Indian Ocean, offering personalized service and a special menu for two. 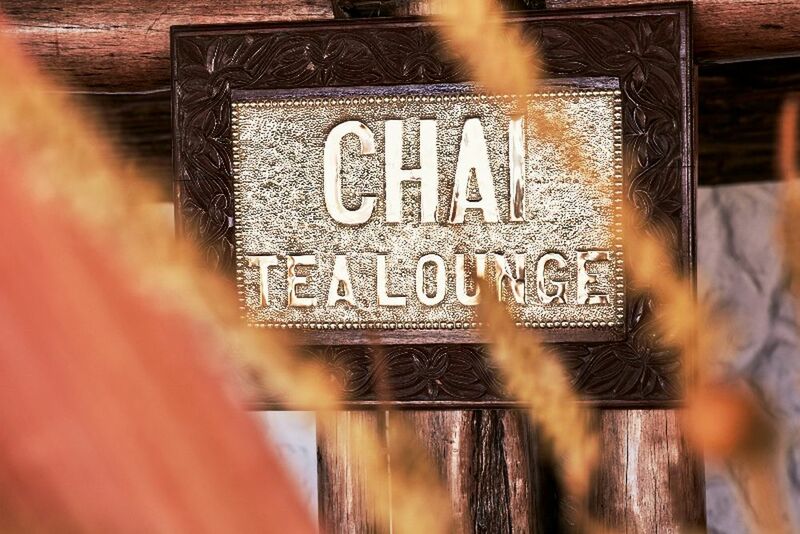 The Chai Lounge serves delicious coffee, tea and cakes in a relaxing atmosphere with Zanzibari beds and coffee lounge. 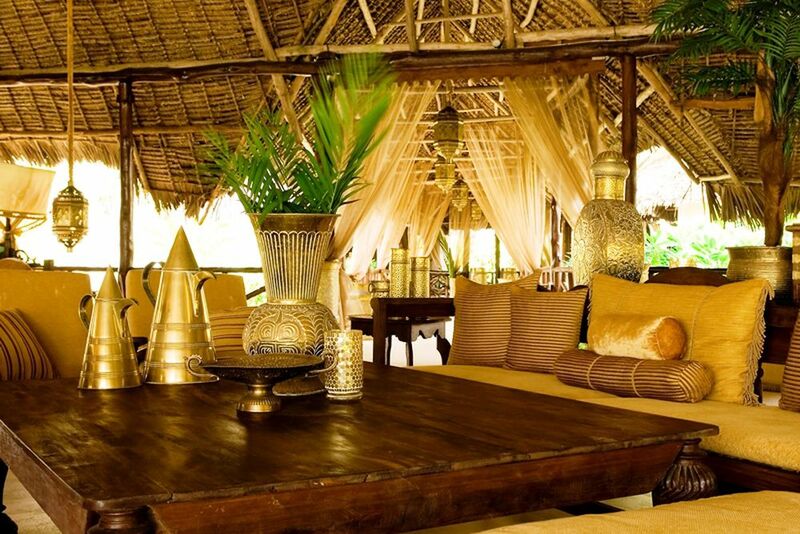 The Baraza Bar is the fine whiskey and liqueur bar complete with a selection of cigars in a stunning Swahili Baraza. 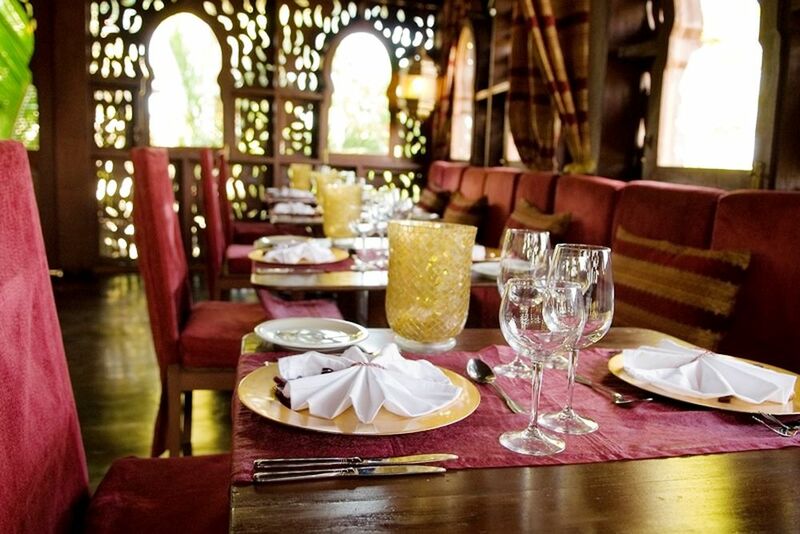 The Sultans Table is a fusion of Indian and Swahili spices, offering the very best seafood in a stunning venue overlooking the Indian Ocean. 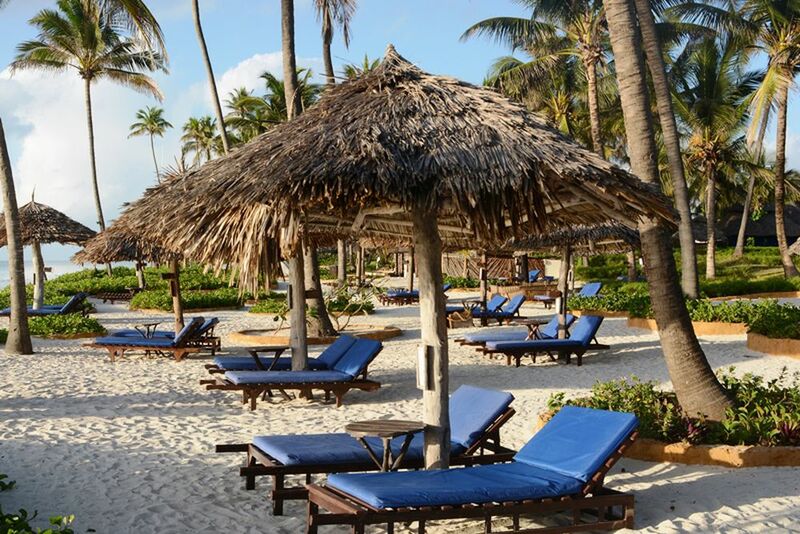 The Breezes Beach Club and Spa has unparalleled standards of luxury. 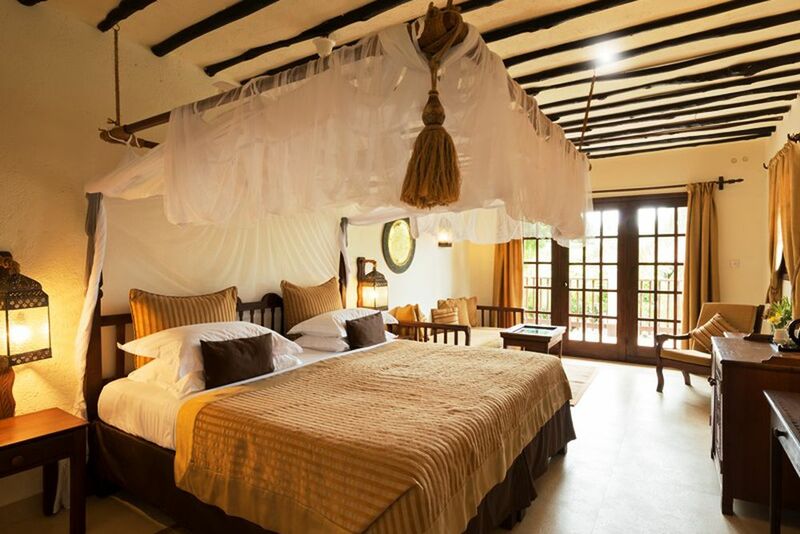 The traditional African décor combined with modern elements and bright colors is featured in all rooms. Room amenities include air-conditioning, a fridge, a safe, coffee/tea making facilities, hair dryer, and a pull-out sofa. None of the rooms have a TV so that you can instead focus on the breathtaking, panoramic views. Standard Rooms—Located on the ground floor of the building, these rooms provide seclusion, peace, and relaxation. Enjoy views of the lush garden on your terrace. Deluxe Rooms—Located on the ground floor, these rooms have beautiful terraces that look out to the stunning ocean. Suites—The suites are located on the first floor of the building. 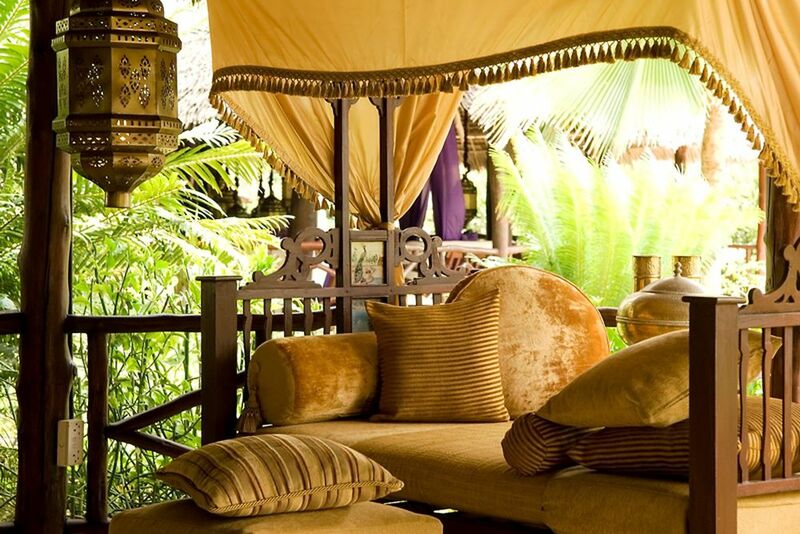 Enjoy the tranquil ambience on a large balcony with daybeds where you can sit back and relax. Stimulate your senses at the Frangipani Spa! 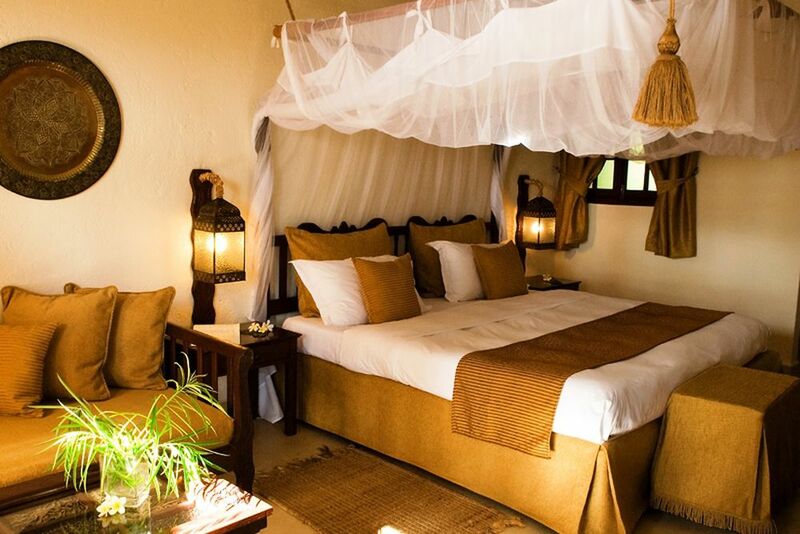 In the beautiful setting reflecting a sophisticated Swahili style enhanced with candlelight and spice scented aromas, you can enjoy a variety of treatments and therapies aimed to relieve the negative impacts of modern life. The Fitness & Aerobics Studio is open every day to all guests and offers the latest fitness equipment so that you can stay active even whilst on holiday. 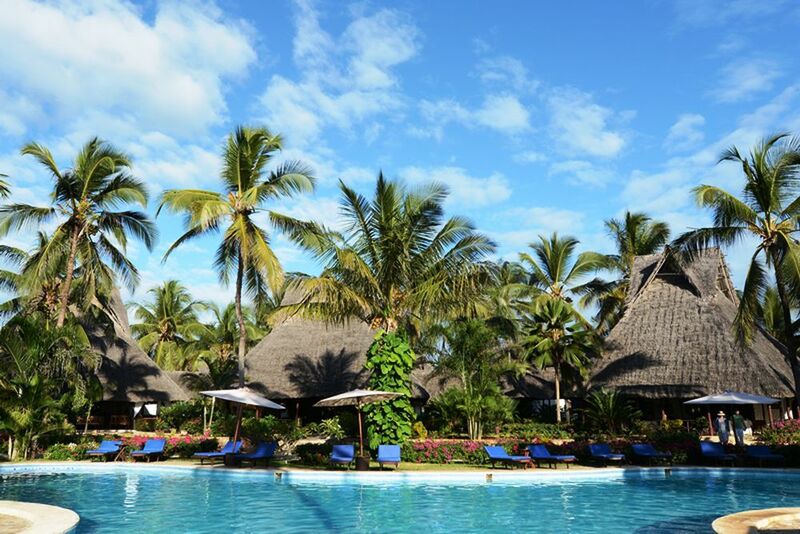 Tennis lovers can play a few sets in front of Zanzibar’s backdrop at the floodlit tennis court. The water club offers everything to discover the underwater world and its surroundings! Snorkeling, boat trips, water shoes and kayaking are available for a fee. The five-star PADI diving center offers courses for beginners and adventures to the colorful underwater world with experienced divers.